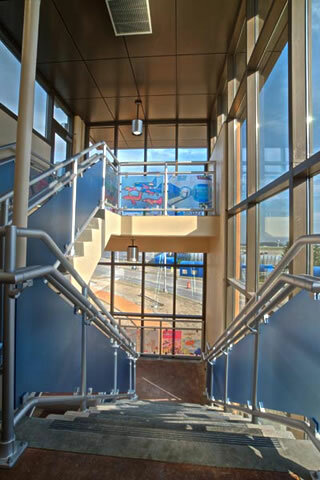 Architectural Metals offers architectural railings and aluminum handrail systems that meet differing architectural styles and tastes. All of our systems can be designed to meet OSHA, IBC, BOCA, SBC, & UBC. Various combinations of aluminum pipe, infill panels, and fittings can be selected for use in just about any building application you may have. All infill panels are manufactured to meet the appropriate codes. To do this, all materials, whether wire mesh or perforated, must be the correct dimensions and thickness. Installed testing equipment allows us to guarantee that our panels will meet these codes. All steel infill panels meant for outdoor applications are electro-coated in a 4-step process that adds a corrosion resistant layer, then powder coated to our client’s specified color. The electro-coating eliminates the need for much more costly aluminum or stainless steel when these requirements are driven by corrosion concerns. Architecture Metals offers several infill panel options, including: Welded Wire Mesh; Round and Square Perforated Steel; No-Frame Perforated Steel; and Architectural Infill Patterns. 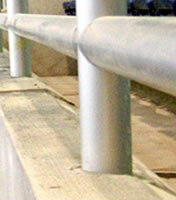 Also available are Component Picket System and Panel Retention System. These options are described below. Load carrying strength of wire mesh panels cannot be calculated, therefore, we test the complete panel design on our test rig to ensure it passes the appropriate code. 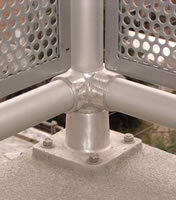 “NO-Frame” Perforated Steel is our most cost-effective infill panel system. 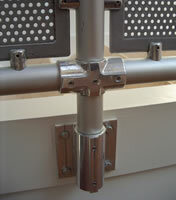 Cost is reduced by eliminating the fabricated frame (also called hem or U channel) around the outside edge of the panel. Different hole sizes and stagger patterns are available on special order at an added cost.Maximum amount of open area is 50%. 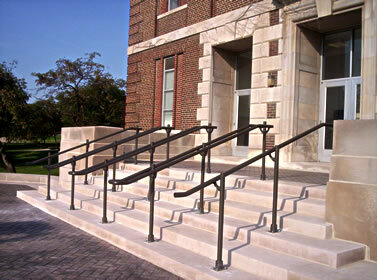 Handrail systems with slotted hole pattern infill will cost 25-35% more per linear foot than standard infill. All patterns shown are in carbon steel, e-coated and powder coated. Decorative hole patterns cost approximately 35-40% more per linear foot than standard round or square patterns, and require special order. 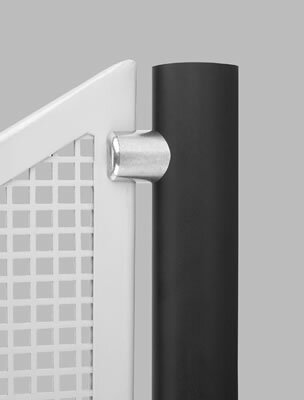 The component picket system uses mechanical connectors that are specially machined to attach pickets to top and bottom rails. These connectors prevent any turning or slippage of the pickets (a common problem) and have the usual advantage of mechanical systems in having no welding marks. This is a very cost effective yet aesthetically pleasing solution. 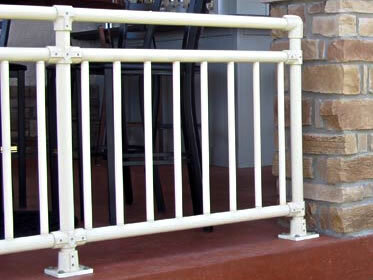 Pickets are 3/4 inch Schedule 10, and railing is available in mill finish aluminum, anodized, or TGIC Polyester powder coat. Standard finishes for fittings and pipe are architectural mill finish and clear anodized aluminum. 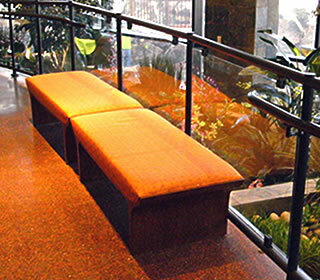 Our clear anodized coating is specified as M10C22A41. It is architectural class with a nominal thickness of .7 mil. Powdercoat colors are available in a wide variety of colors with the standard being TGIC Polyester, a highly weather resistant and durable coating. Depending on the color requirement, TGIC Polyester products that are compliant with either AAMA 2603 or 2604 may also be available. Click to view Retrofit Panel Infill System Informational flyer in a new window. 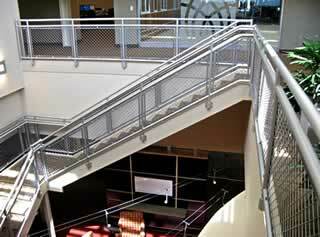 These panels, either perforated metal or wire mesh, can have different openings, and will also remove the effect of “ladder effect” railing. Rivet Nut – requires special tool, RST-3 to insert. This parking garage has 5 stair towers and the architect/owner wanted to make a visual statement. They specified a component railing system with clear anodized finish, and selected acrylic panels with custom graphics as the infill system. Installation was a breeze with the frame coupled with our 2-piece panel clips erected on-site. This allowed the acrylic panels to be installed afterwards. 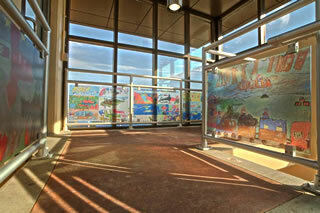 The panels utilized custom artwork done by local school children — their full size artwork was transferred to the infill panels through a special process. The result was a variety of truly unique panels on every level railing bay in the parking garage. In an airport parking garage, our personal favorite was a panel showing the Hindenburg dirigible burning up — just what air travelers need to see prior to boarding an aircraft.